“First Responder” in a medical emergency at your business location. It is important to note that statistically 97% of ALL accidents or illnesses requiring emergency attention fall into a “breathing” category. Therefore, the Med-Alert emergency oxygen unit should be very quickly accessible by any person present to stabilize the victim until advanced medical help arrives. It is very important and medically sound to provide an immediate source of emergency oxygen within 1 to 1&1/2 minutes to the victim. The ability to respond within that period of time can greatly reduce the probability of brain damage due to oxygen starvation caused by shock. The Med-Alert oxygen unit meets or exceeds all Federal guidelines for emergency oxygen use without a prescription. This oxygen unit was specifically designed to be used by someone who has no knowledge of oxygen administration or usage, and no medical background. If the victim is one of some 350,000 people who suffer Sudden Cardiac Arrest (SCA) each year, the heart has stopped and the victim needs defibrillation. 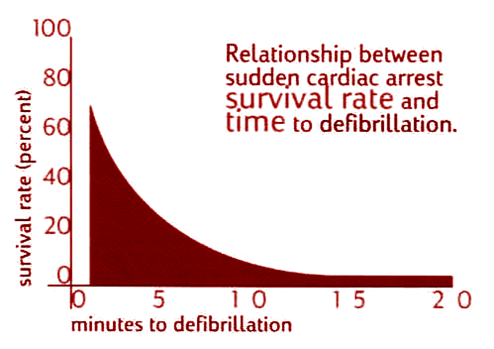 If defibrillation occurs in the first few minutes the victims chance of survival approaches 80%! 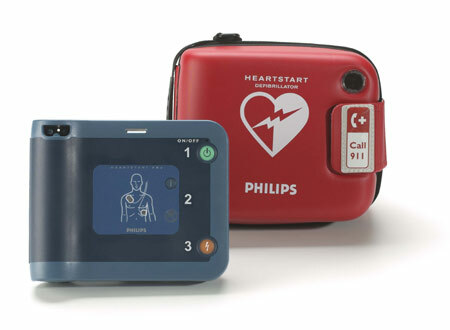 MIC is a national distributor for Phillip’s HeartStart™ Automatic External Defibrillators (A.E.D.) < Click to see information and photo below. Med-Alert serves such corporations as: The PGA Tour, American Golf, BSL Golf, Arvida, The Hyatt Corporation, Marriott Corporation, Doubletree Hotels, Wyndham Hotels, Omni Hotels, Holiday Inn, Embassy Suites, Hilton Hotels, Exxon, Texaco, Bristol Myers, Pfizer, Crum & Forster, Otis Elevator, and many other major law firms, accounting firms and hundreds of general businesses all over the country. 1. ADDITIONAL INSURED COVERAGE ($1,000,000): Protects all employees in the USE of the Emergency Oxygen Equipment. This is in addition to the five million dollars of PRODUCTS liability coverage provided by the manufacturer and the one million dollars of PROFESSIONAL liability acquired by Med-Alert, covering the information taught in the classes. 2. VERY LIGHT & PORTABLE EMERGENCY OXYGEN UNIT: Especially when compared to many of the old steel cylinder units. The unit weighs only 9 pounds, and comes in a soft portable case that can be easily slung over the shoulder to keep the hands free to carry a First Aid Kit or to open doors on the way to the victim. 3. CONSTANT-READING GAUGE: No possibility of misreading the unit as “empty”, as has happened on other units where the contents gauge shows “empty” until the unit is turned on. The gauge, manufactured by Erie Medical, Inc., is the same type as used on Air Force high-altitude equipment. 4. SINGLE-USE MASKS: Our mask and hose are “single-victim” use only to eliminate the possibility of cross contamination. Each mask is sealed in a sanitary bag and marked by a bright orange sticker that must be torn to access the mask. Once the seal is broken, employees are instructed to immediately notify Med-Alert Response to have the mask, hose and cylinder replaced. In addition the hose is a non-blocking type via a “channeling” technique. The purpose of a non-blocking hose is to eliminate any possibility of unknowingly cutting off oxygen to the victim causing the victim to re-breathe excess amounts of his / her own carbon dioxide. 5. CONSISTENT TRAINING: Med-Alert provides on location training classes at each property. These classes are described in more detail on the Training Sheet. It should be noted that the training is of superior quality at all locations because it is our company’s policy to maintain central control of class curriculum and instruction techniques. Med-Alert International does NOT use independent contractors to teach its classes. 6. CENTRALIZED ACCOUNT MANAGEMENT: All information regarding each individual property as it pertains to equipment, training, service etc., is cross linked on a central computer system in our Houston Corporate office, in order to provide prompt answers regarding a specific property, a group of properties or the account as a whole. These answers can be provided through our National “800” Hotline. This is our basic emergency response setup. It is to be used in any accident or injury where the victim is still breathing on their own. This system is designed to be wall mounted for easy access. The MIC Emergency Oxygen unit is designed for use by anyone so that life saving oxygen can administered to a victim of accident or injury. The “First Responder” 1st Aid Kit is not your basic 1st Aid kit! This portable kit contains individually packaged components ready for use in cases of burns, eye injury, bleeding etc. The contents and use of these components are covered in our Training Sessions. Replacement components are available by contacting us at our 800 number or by filling out our Contact Form.